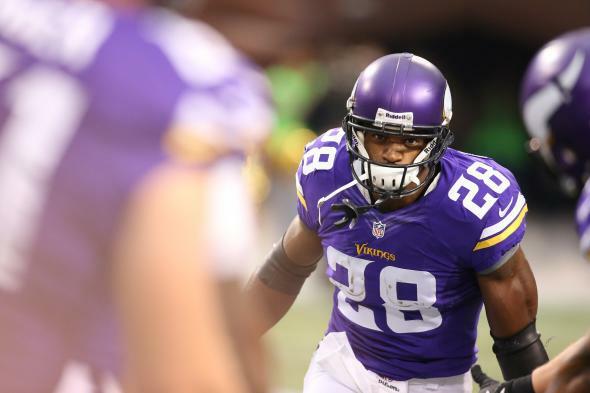 Adrian Peterson child abuse: Minnesota Vikings star says he beats his kid because he loves him. Adrian Peterson loves his son. That does not excuse child abuse. Above, Peterson playing against the Chicago Bears in 2013. The details, on their face, are inexcusable: Adrian Peterson, a 217-pound running back for the Minnesota Vikings, was indicted last week for “reckless or negligent injury to a child.” Peterson allegedly whipped his 4-year-old son with a stick, leaving bruises on his back, open wounds on his legs, cuts to his scrotum, defensive wounds on his hands, and perhaps more: “Daddy Peterson hit me in the face,” the child reportedly told authorities after doctors examined him and identified him as a victim of child abuse. In case the testimony of a 4-year-old kid and his doctors isn’t enough, there are pictures to prove that this was more than just a swat on the rear end. But proof is not the issue here. Peterson himself admits that he beat his child. His defense is that he beat him lovingly. In cases of domestic abuse, violence and love don’t just exist under the same roof; they work in tandem. If Dockett and Ingram Jr. had come away with alternate conclusions about the motivations and fallout of their parents’ discipline—“It was all hate though”; “I hate both my parents”—they would not be defending Peterson today. Appealing to love allows abusers to maintain control over their victims far after they leave the home and serves to perpetuate the violence across generations. Few abusers are wholly evil people who openly hate their kids and seek to raise them exactly the wrong way. Those monsters are easier to recognize and convict, which makes so-called loving abusers in a way even more dangerous: After all, who would want to stop a man from loving his own children? Adrian Peterson and his child are not floating “different stories.” A frightened child suffering from abuse and a father who says he does it because he loves the kid are telling the same narrative. The fallacy here is so obvious that it has coalesced into a domestic violence cliché: “He hits me because he loves me.” Adrian Peterson’s claim that he did it for love is not a defense of his actions. It’s a warning sign that he continues to pose harm to his kids. * Correction, Sept. 15, 2014: This post originally misstated that Mark Ingram plays for the New England Saints. There is no such team. He plays for the New Orleans Saints.